The Wardog quietly controlled the strategy in this episode, despite Ron's titular claim to (Ron) being the puppetmaster. For his efforts, Wardog was rewarded with giggles between Julia and Gavin when his name came up as they discussed his suggestions, and scattered Tribal Council laughter as David grudgingly admitted "It's crazy for me to be saying I agree with Wardog on a particular point here, but...."
And yet, despite the derision, Wardog's choices dictated the outcome of the episode, just as they had on Manu and Lesu. Wardog never receives much respect, and that's a problem if he plans to win. But will he win everyone over eventually? Maybe. It's hard to go from comic relief to champion, and it's not obvious what he can do to change perceptions between here and the endgame, but he *is* a law student, and 18 days ought to be enough time for the Wardog to build a case for himself. Right? The takeaway message from that edit was that this blindside was Wardog's doing, even though other people seemed eager to add it to their résumé, and also that it was partly a group effort. Even if Wardog has yet to win the respect of his peers, he's slowly gaining traction with the editors. Could the Wardog's long game be a variant of Tyson Apostol's winning path in Blood vs. Water? Where Tyson masked his strategic threat behind a facade of comedy, Wardog has disarmed everyone by demanding to be called by a moderately goofy-sounding nickname, and by refusing to talk strategy until after the immunity challenge. A guy who was repeatedly mocked at Lesu for obvious scheming. A guy who just publicly camps out on a log at the beach, trying to sway errant Kamas. In coming across as so obvious he's overlookable, could Wardog have successfully masked his threat level? Or has he undermined his own ability to sell his game at the end? It's still to early to tell, but it's generally better to shine late than too early. The one narrative strike against Wardog? Victoria's resistance to the plan. That's notable because Victoria already has an impressive blindside to her credit, when she duped Aubry with a fake women's alliance on post-swap Manu. While the short-term results indicate she and her fellow young Kamas move on from this vote looking okay-ish, Gavin and Julia clearly were following Wardog's guidance. It's not immediately clear why we were shown Victoria not wanting to hop on the Wardog train, but it seems important. One explanation might be because the numbers didn't really make sense for the young Kama three. Just as Rick was right to object to David and himself being mere pawns (er, "passengers") to a larger group of three (the Kelley/Lauren/Wardog trio), the young Kama three are now outnumbered by their new allies. With David on board, there are *four* Lesus, and Aurora doesn't actually appear "with" the Kamas in any meaningful way. If Rick returns to being a free agent, you could easily see the Lesu four pull him and Aurora in on the next vote, then take out one of Gavin or Julia. Or they could scoop up Julie and Ron to do the same. That would bring the original tribe numbers even at 5-5 (or 4-4, with Rick and Aurora formally unaffiliated). So why is Victoria's resistance important? Because if it all falls apart (and with 11 people and so many "packages" left, it certainly could), she will look like the sage strategist, while Gavin and Julia will look like they were snookered by the Wardog. Maybe it's to set up a future strategic division in which Wardog and Victoria leading opposing sides? We shall see. No matter what happens, it's nice that Wardog finally seems to be receiving some credit, and also to see some of the Kamas finally playing the game. As fun as this episode all was, the outcome had the low-level impact of a first-episode boot. We saw the expulsion of a character we'd barely seen (Eric), and revealed divisions within Kama that had never been mentioned prior to this episode. The two key characters involved in making the Big Move (Julia and Gavin) had also barely been shown, and in fact, what little we had seen of Gavin showed him forming an allegedly solid alliance with Eric. Similarly for Eric, he'd probably been a leader on post-swap Manu, that was never really shown. Yet this episode crafted an entirely novel narrative seemingly out of thin air, where Eric and Ron were Kama co-leaders of strategy. Had we ever even seen Eric and Ron talk to each other one-on-one before this episode? Or, for that matter, Julia, who wanted him out? The other division that didn't really make sense (except intuitively) was Julia being closer to the other two younger Kamas, Gavin and Victoria, since they'd been separated at the swap. Narratively, Gavin seemed to be with Eric, and Julia maybe with Julie? Or Ron? All by herself? 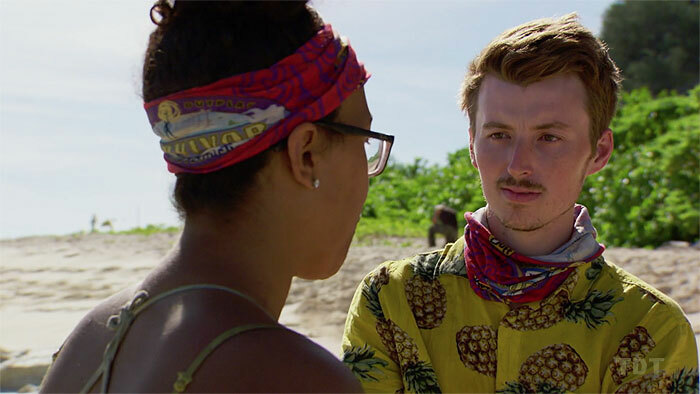 So while it was fun to finally see them making a move and breaking up the Kama plurality together, it felt less triumphant than it could have, since we'd only ever seen flashes of Gavin or Julia before (and when we did, it was mostly to hear their thoughts on Aubry and/or Joe). Still, this episode was fun. Underdogs overcoming a controlling power is always entertaining to watch. But wouldn't it — just maybe? — have been slightly more fun if we'd had at least some idea who these central characters are/were? Eric seems like a nice guy. Real-life hero (firefighter), family man, gets along with everyone, does relatively well in challenges. Were we meant to be rooting against him for some reason? Sure, his repeating "loved ones" over and over was sort of annoying. Similarly, Gavin and Julia have a lot of potential as smart, game-aware superfan players. Would it have hurt to hear their thoughts on the game at some point, perhaps while they were struggling under the oppressive thumb of the Ron/Eric diarchy? Just throwing that out there. 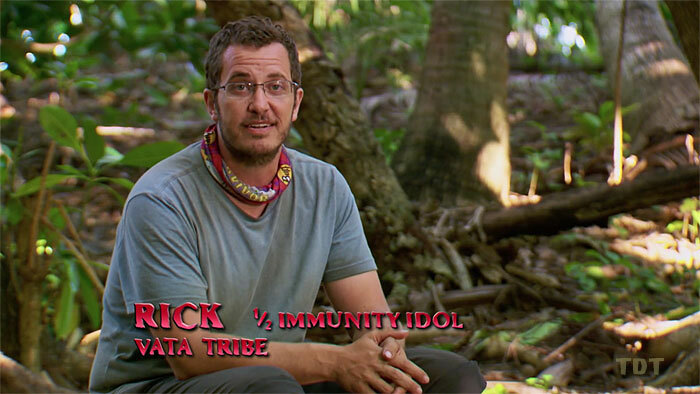 To be fair, it was pretty wonderful that Rick found that extra vote while on Edge of Extinction, then sent it to Aubry, who, while she'd already found a game-saving idol under her own power, took it as a sign that maybe her game was finally picking up. It's probably for the best that we saw all that instead. Even though neither event was ever mentioned again. Aurora's newly (re-) gifted extra vote advantage expires (as seen above) "when there are seven people left in the game." This is weird. In Redemption Island seasons, the final duel to re-enter has come with just four regular players left in the game, at the start of the finale episode. The Final 7 vote (from seven down to six players) should be much earlier than that. Normally (at least in recent seasons), that vote comes in the second-to-last episode. But with so much extra going on this season, it might be even earlier. Even considering that recent Survivor finales have begun cramming in three immunity challenges, the F6 and F5 Tribal Council votes, F4 firemaking, AND the final Tribal Council and jury vote, it's hard to imagine how they'll also manage to squeeze in all the of another Extinction re-entry challenge. In addition to the inherent spectacle of the challenge itself, it will mark the true end of the Edge of Extinction twist, with one final person coming back into the game, and the losing competitors at last heading to Ponderosa. No stay of execution from Probst this time! The tear-soaked drama of that final dismissal probably won't be something that can be cut down to a 10-second commercial break bumper. (2) The final re-entry challenge takes place pre-finale. Let's imagine the F7 boot takes place at the end of Episode 12, and the extra vote expires there. Episode 13 is then the final re-entry challenge, bringing the numbers back up to seven. There's an IC, and it ends in a second F7 vote. That leaves a finale that resembles those of the past three seasons: six people entering as usual, three ICs, two votes, and F4 firemaking. 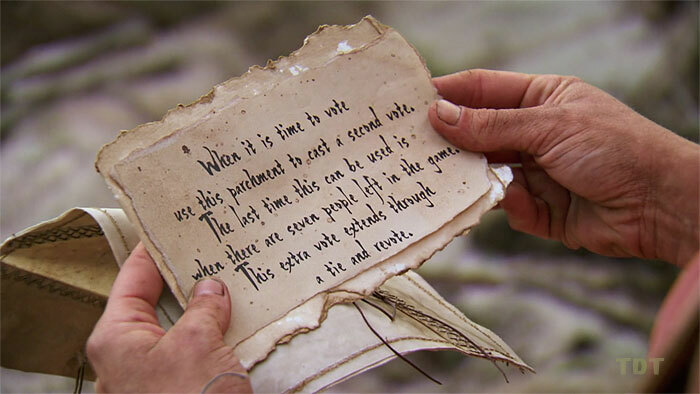 That also forces the final re-entering player to survive three votes in order to reach firemaking, which seems a bit more fair than the Redemption Island format. Regardless of which scenario is closer to accurate, the timing of the extra vote expiration raises a lot of questions. Why should the extra vote expire at F7, and not at F5, like an idol? Even if it isn't an indicator of where the re-entry challenge takes place, isn't it weird for the last possible use to be when an odd number of people are present, where at best it can force a tie? If it's all this maddeningly opaque to fans sitting at home, imagine the exquisite mental torture to Aubry, who just wants that second shot to get back in the game, and now has reason to believe it might be happening in a matter of days. Fun twist, guys. Nice work. - Subtle theme consistency: It was a neat bit of artfulness to pair the story of Rick and David "divorcing" strategically and trying to decide how to assign custody of their joint idol, alongside the constant refrain of "loved ones visit" from Ron and Eric, trying to keep the Kama clan together. Survivor: It's just one big dysfunctional family metaphor. - Make room in your bag for: The idol nullifier. It's odd that it has yet to rear its ugly head. None of the current players have seen it in action. Kelley and Lauren are pretty sure they're invulnerable if they play their idols. Is the reason that we haven't seen it yet that the people with the idols are currently the underdogs? Weird coincidence, if not. Still, it'll probably show up at Edge of Extinction soon, then be sent to someone in-game, right? - Also make room for...? While I'm glad she's still in the game, a part of me wants Aurora to be voted out without playing the extra vote, just so that she can then find it again on Edge of Extinction and send it to Rick, completing the circle. It's a little weird that we didn't get any acknowledgement from Aubry that "Oh yay, and here's the extra vote I never used" before she FedExed it back to Vata camp (from 4444 Edge of Extinction Drive). - Always be throwing? 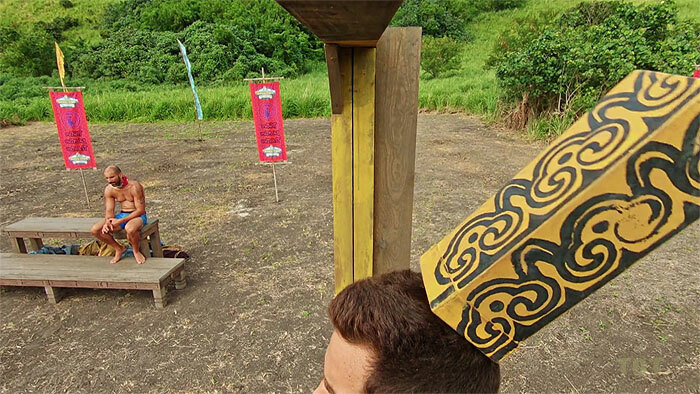 Gavin and Wardog seem to be having a race to see who can drop out first from individual immunity challenges. Given that both consider themselves superfan strategists, could they both be following one of Colin Stone's most famous strategic rules? Whether or not it's intentional, they're both currently contenders to break the single-season lowest MPF record (currently owned by Bruce Kanegai, Panama - Exile Island). - Breaking the mold: People receiving idols and advantages, free in their bag, has become the new norm this season. This goes against Probst's harrumph-filled previous defenses of people who have already found idols having an advantage in finding a second one (in paraphrase: "those people are just harder-working, they went out and earned it"). Still, this seems like a good development overall. People voted out can send last-ditch help to their remaining allies. It's a mechanism to drive gameplay, even with an all-powerful alliance. It just doesn't seem very ... fair. Still, Survivor's not fair, so ... it's fine. Again, if we're stuck with people stranded on Edge of Extinction either way, might as well give the people there something to do. Gordon Holmes at XfinityTV.com: "Scary Moment as Player Blacks Out During Challenge"
Dalton Ross at EW.com: "A family (visit) torn apart"
Stephen Fishbach at People.com: "A Disastrous Mistake Upends the Edge of Extinction Season"
Andy Dehnart at Reality Blurred: "Survivor's 'blank sheets of paper' fill them in with a blindside"
Rob Cesternino & Stephen Fishbach at RHAP: "Know-It-Alls | Edge of Extinction Episode 8 Recap"
Rob Cesternino at RHAP: "Abi-Maria Gomes Recaps Episode 8 of Survivor: Edge of Extinction"
Brad & Andy at The Purple Rock Podcast: "Edge of Extinction Episode 8: I'm the Puppetmaster"
Colin Stone at The Dom & Colin Podcast: "The Pesky Kama Splice -- Episode 8 Recap/Analysis with Kirsten MacInnis"